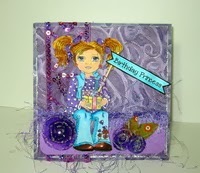 This weeks entry for Inky Impressions is a cute Birthday Girl. She reminds me of my cousin's little girl- sweet as can be waiting patiently for her gift. Digi Images are so easy to use, now digi paper I am just learning how to use, although once I have used it a time or two I am sure it too will be awesome! !